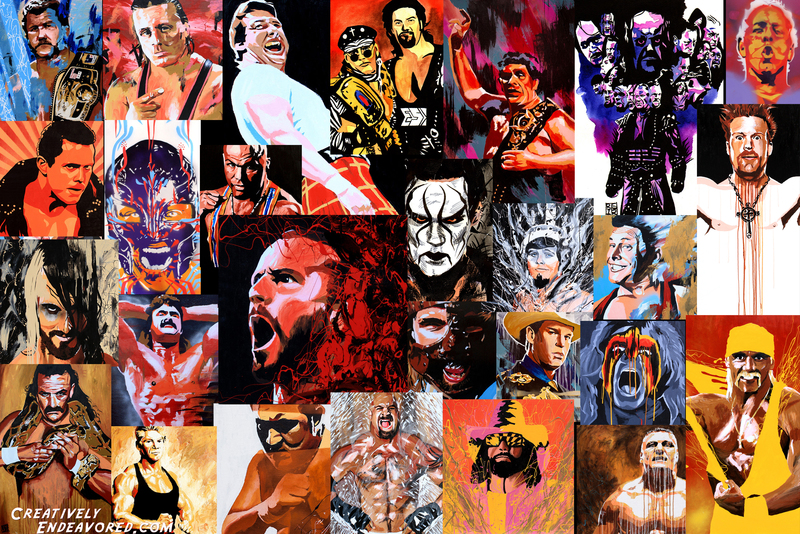 After searching the interwebs for more wrestling artwork last weekend, I once again came across the work of Kansas City artist Rob Schamberger. Schamberger made many pro-wrestling & mainstream news sites in 2012 with his idea to paint every NWA Champion & display the finished collection in a KC gallery. Well when I came across his official site once again, there was much more pro-wrestling material than just former NWA Champions. So I took it upon myself to put together a desktop wallpaper of his work and honestly it’s been on my laptop, iPad and phone for the last week! I couldn’t help but share his greatness with fellow wrestling fans but first, I wanted to post some background on Schamberger from his official website. Rob Schamberger is a Kansas City born and bred artist with a lifelong love of comic books, illustration, cubists (Pablo Picasso is his all-time favorite artist), street artists, quality crime dramas, and other hipster things. He lives in a lovely loft overlooking the river with his wife and two cats. Rob has had one book, The Believer, published with Image Comics, written by Rob and drawn by Thom Thurman. He has self-published four graphic novels he wrote and drew: The Black Chamber, Too Late, Too Soon, and The Promotion. He has had comics and illustrations published by The Kansas City Star. His illustrations and paintings have been exhibited in various galleries and museums on a consistent basis since 2008. His work has been featured on wwe.com. Rob’s studio is located at 108A Missouri, Kansas City, MO 64106. Studio visits by appointment only. Please be his friend on the Facebook. Follow him on the Twitter. Tumble with him on the Tumblr. Send a love letter to robschamberger at gmail dot com.